Here in the States, the day after Thanksgiving is known as Black Friday. This isn't because millions of people are sifting through their Flamethrower Turkey leftovers. Instead, it is the biggest shopping day of the year, the day when retail shops and chains all over America throw economics aside and slash prices like Sweeney Todd on Red Bull. The stores open at 6 a.m. and the masses stampede, looking for $19.99 DVD players, Playstation 3s for under $200, and televisions priced to move like a tidal wave. People swarm the stores like maniacs, pushing, shoving, fighting over the last bargain copy of Guitar Hero, and generally setting aside all reasonable behavior in the quest to max out their credit cards. 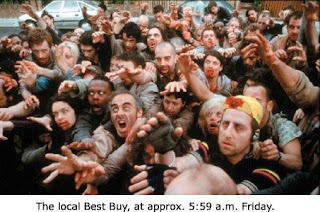 Here's how you can not only survive Black Friday, but succeed amidst the madness. Try stores that don't sell electronics. Most bargain-crazed shoppers are looking for a sweet deal on a big-screen telly or game system. You'll have a much quieter time at the Bed, Bath, and Beyond sale, Barnes and Noble, or better yet, Tuesday Morning. That place will be even emptier than usual. Use a Segway. You'll be able to see above the masses, and can easily run down any overly obnoxious shoppers and clerks. Make friends with the staff weeks in advance and get them to let you in the back door before opening. Just don't walk around in front of the glass doors taunting the other shoppers. They'll kill you the moment the doors open. Cough a lot and make dry heaving sounds. If people ask, just tell them the doctors don't know what it is but you weren't about to stand for being quarantined on the biggest shopping day of the year. Know your shopping cart. A good shopping cart is not only a smashing place to keep your goods as you go, but it's also a handy weapon for warding off other shoppers. The downside is that the bolder advesaries will try to pull things out of your cart. See the bit about the cattle prod in this case. The old "pinch the bottom and then point to someone else" routine. Sleep In - It's what I always do. I think the earliest I've ever been out on a Black Friday to the shops is about 2:30 p.m. I still managed a decent DVD/VHS combo and only had to step over two bodies to get it. Skip it all together - This is my usual strategy. I stay home, put my feet up, and watch the action on the gridiron. No bruises, no fuss, no trip to hospital in the ambulance... A day well spent. *On a related note, I have a large cache of Mendit, Hercules Hooks, and Zoorbeez that I will be giving as Christmas presents this year. Flamethrower Turkey - Take one large thawed turkey and a large flamethrower. Fire up the bird for about 2-3 hours. Great crispy skin on this one, and all dark meat. Acid Turkey - Take one large thawed turkey and dip into a large vat of hydrochloric acid. Then, go out to eat at whatever fast food joint is open on the holiday, and be glad you're not the turkey. Turkey Acidophilus - Bake one large turkey normally. Slice 1 lb. turkey meat. Blend with yogurt into a smooth puree. Serve in soda glass with straw and cranberry garnish. Turkey Knievel - Deep fry a large turkey. Strap it to the back of a motorcycle. Jump 12 buses. Pick turkey bits off the ground and clean. Mind the broken bones, including the turkey's. Enjoy with a nice IV. Turkey Sushi - Let loose turkey in house with crazed sushi chef. Keep first aid kit handy. Turkey Detroit - Roast one turkey normally. Serve with bitter dregs of another football season gone wrong. Then, run over turkey remains with a Ford. Have Ford repaired for damage done to it by turkey. Turkey Surprise - Serve steak instead.